Some time ago through odd circumstances I came into possession of two sketchbooks. The man they belonged to is no longer living. I keep sketchbooks so of course I looked through his. The books contained some writing but mostly pencil drawings. These included room interiors, a couple of portraits and quite a few crudely drawn nudes, some phallic male images but mostly female. Various people made entries over a long time span so with the exception of a few signed pages it is impossible to know who did what. The moment I first saw these drawings I thought them more honest and powerful than anything I do. That initial reaction has softened somewhat but that was my first gut response. Why would anyone do these drawings? Are they simply the scratchings of some old pervert? I remember doing similar, though far less explicit, drawings when I was quite young. What if there is something primal going on here? 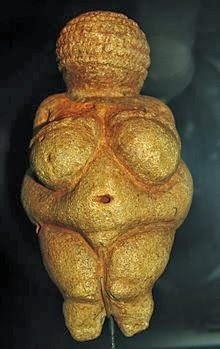 What if they are a modern mans Venus of Willendorf? Capturing femaleness in it's most basic form. I know I'm out on a limb here but I just found this interesting. I came across a 1936 essay by Walter Benjamin titled "The Work of Art in the Age of Mechanical Reproduction". In it Benjamin warns that reproducing works of art can limit or even destroy the originals uniqueness or "aura". He was warning about new reproduction methods of his era and couldn't have imagined the ease and number of todays options. I think he was on to something. I would extend Benjamin's thesis to include the creation of a work of art. I have said many times how I believe works done from life posses a quality or power missing in photo or other reference derived works. I never had a specific term for this until now. It is the aura. Be it a landscape or a still life or a person, capturing an aura can only happen during the physical interchange between subject and artist. I wince when I see "landscape" painters working from photos or now computer screens. Take your easel out and sit under a tree. The aura is illusive but it is there. It isn't easily harnessed but the only chance of truly capturing it is in that moment and environment.